This week begins our annual review of the top prospects by position. Between now and Opening Day, we’ll examine one position a week by looking at both those rookies ready to contribute in the big leagues now, as well as the top 15 long-term prospects at each position. Again this year, our topic schedule will mirror the position covered in Market Pulse the same day, to give you a complete look at the position. Today, we take a look at the top catching prospects. Some of you have ventured over from our C/DH Market Pulse article looking for any good news about the future at catcher in fantasy. Others are here for a list of names to target in drafts to build up a farm system with quality fantasy catching prospects. We’ve got good news for all of you. There is help coming in the not-so-distant future, with a few prospects who already made their MLB debuts. There is also incredible depth at this position, which should allow for several potential options at the position. Eight catchers made the HQ100 this off-season, which is up three catchers from 2018 and up five catchers since 2017. For the second year in a row, a catcher has made our Top 25. Giants prospect Joey Bart, the 2nd overall pick in last year’s draft, came in at #23 this year. Last year’s top-rated fantasy catcher prospect fell out of the Top 25, but not due to concerns with his bat. Many evaluators fear Padres prospect Francisco Mejia’s long term home at catcher is in danger due to his weak defensive ability. Despite these concerns, he still made our Top 50, slotting in at #47. There is a stigma out there that carrying catchers in your minor leagues is bad because the reliability of catchers panning out is extremely low. With the poor catching options in fantasy today, it’s best to pounce on a deep catching crop now than pay elevated prices when they are breaking into the league or become established. There are several great options on this list and a few more, like Padres prospect Luis Campusano, Twins prospect Ben Rortvedt and Yankees prospect Anthony Seigler to name a few, who didn’t make the list but project to be regular catchers at maturity. The dollar ranges listed below represent projected values for 2018. See a more detailed scouting report on each player by following the link to his team's organization report or PlayerLink page. While Francisco Mejia’s ranking dropped in the HQ100 rankings, the mid-season trade to San Diego may have saved his future fantasy value. It became apparent Cleveland’s confidence in his defensive ability was fleeting when they began trying him at other positions. The move to San Diego came with a vote of confidence from general manager A.J. Preller, who stated Mejia would remain at catcher upon announcing the trade. The compact, switch-hitting Mejia is a doubles machine. A contact-oriented hitter, Mejia has struggled in a few cups of coffees in the big leagues since 2017. Ignore the MLB slash lines and buy peripheral stats from his 2018 Triple-A stint. An 80% ct% and a X/H% hovering around 40% help carry the profile. His ability to make loud, barreled contact, even in his San Diego stint, should help normalize his MLB production. Buy his XBH ability but know the high BA is a few years away. Only thing in Mejia’s path to playing time is incumbent C Austin Hedges. 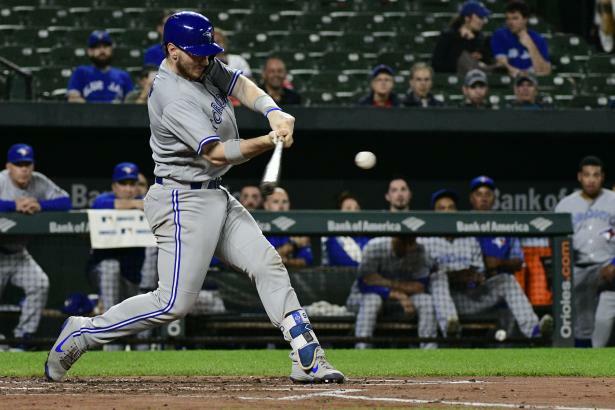 In a late-season callup, it looked like Danny Jansen was already the Blue Jays primary catcher. The trade of Russell Martin to the Dodgers further confirmed the belief Toronto is ready to hand the pitching staff over to their rookie backstop. Jansen brings a plus hit tool (84% Triple-A ct%) and superior OBP skill (13% Triple-A BB%) to the table, even though the power potential may be tapped out in the 10-15 HR range. Jansen has made strides defensively, which should keep his bat in the Blue Jays lineup for years to come. This season, expect playing time, ct% and a solid rookie BA. However, beware of power regression. Barring injury or struggle, Sean Murphy is the readiest among the non-Mejias and non-Jansens on our list to make an impact in the big leagues this season. Always known as a backstop who neutralized the run game with a plus-plus arm, the 2016 3rd round pick out of Kent State enjoyed a true breakout season, both with his receiving skills and with his bat. Murphy has always been a contact-oriented hitter. However, in ’18, he used better leverage in his short, compact, line-drive swing, which caused his HR numbers to spike while still maintaining his ability to hit for a high BA. He could be ready to go mid-season and should provide for an offensive upgrade for the Athletics given current options behind the plate. With the acquisitions of Yan Gomes and Kurt Suzuki, it looks like the Nationals catching situation has been solved. However, with Gomes injury history and Suzuki being a platoon hitter in recent seasons, the path to playing to for Raudy Read may not be as clouded as we think it is. Sure, 100 AB may be a stretch. However, the peripheral stats suggest Read could hold his own against MLB pitchers. While the HR rate declined after an 80-game ban for PED, the ct% improved. He has a short-compact swing with a very aggressive approach. Read should be solid in a short burst, which is likely all he’ll get in 2019 and could have a solid career, like former MLB catcher Miguel Olivo. Royals prospect MJ Melendez is one of the most talked about prospects in fantasy and non-fantasy prospect circles. Scouts love his advanced defensive ability behind plate and his patient, power-hitting bat. Only Giants prospect Joey Bart has more power potential at the position. Think 25-30 HRs at projection for Melendez. Problem is, ct% has been an issue, first in the Arizona League and this past season in the Sally League. Catchers with low ct% have shown to have a rougher time refining their swing to improve this deficiency, mostly because of the grind and the instruction needed to be a proficient defensive player behind the plate takes away from hitting development. There is real risk here Melendez batting line looks like Mike Zunino at maturity, which is something owners should consider when investing in Melendez’s upside. Rays prospect Ronaldo Hernandez has an incredibly advanced feel for the barrel and ability to use the strength in his lower half to generate power. He has the most all-around offensive upside on this list with potentially plus hit and power tools. Issue here is the same issue we have run into with Padres prospect Francisco Mejia. Can Hernandez stick behind the plate? A converted infielder, Hernandez’s athleticism has helped his learning curve behind the plate. He lacks natural instincts, which causes him to stab and backhand pitches. He improved as the season wore on getting in front of pitches in the dirt and keeping those balls in front of him instead of going through his wickets or bouncing to the side. If the glove fits, Hernandez is likely a premium fantasy catcher. If not, his athleticism could make a transition to the OF likely, which would make him a solid fantasy prospect. Dodgers prospect Keibert Ruiz is one of baseball’s top prospects, with at least 2 anonymous teams considering him one of the Top 10 prospects in baseball. People often forget about the Dodgers' other catching prospect, Will Smith. Smith has one of the highest floors on this list because of his stellar defensive work, selective eye and power potential. The right-handed hitter does a great job laying off pitches out of the zone. However, his ct% issues hold back his ability of ever having a high BA. However, his patience won’t allow for OBP to crater, making him useful in OBP leagues. Smith has above-average power potential and has the chance to whack 20-25 HR at projection. He could be up this year.